Having done thousands of music reviews over the years, I have discovered a lot of interesting or good music, but not too much of it stands out. 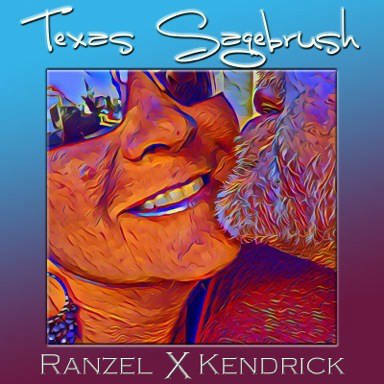 I have to say though that country artist Ranzel X Kendrick’s new album, Texas Sagebrush is exceptional. The first track Any Ole’ Song, should leave no doubt to the listener that this guy’s music is right up there with the country legends. This shouldn’t be surprising given that he apparently is the nephew of Grammy award winner, Roger Miller. Kendrick describes his sound as Texas Roots / Americana, and he has become a pretty much a master of it, so far as I can tell. His style features mellow but articulate acoustic guitar, in a fairly minimalist context, along with sincere and quietly contemplative vocals. Ambiance wise, the songs on this album would not have seemed out of place on the classic soundtracks of films like “Every Which Way But Loose” (which featured hits from Eddie Rabbitt and Mel Tillis.) They are just very professional and have the feel of someone that has been around the block a few times. Texas Sagebrush is very authentic and evokes memories of the last era of pre-popcommercialization of the country sound. This isn’t to say that the music itself is dated though. What a Pretty Day retains the artful authenticity while demonstrating appeal to mainstream contemporary audiences. Rebecca White’s stellar vocals combine the best of indie folk and country elements. At times on this album I even found myself questioning whether what I was listening to was a Greenwich Village coffee house folk tune or a country western song. Just about anyone who hears this music will instantly recognize it as being in the top-tier of its genre.